This 3 bedroom apartment with swimming pool is located in Benidorm and sleeps 5 people. It has air conditioning. 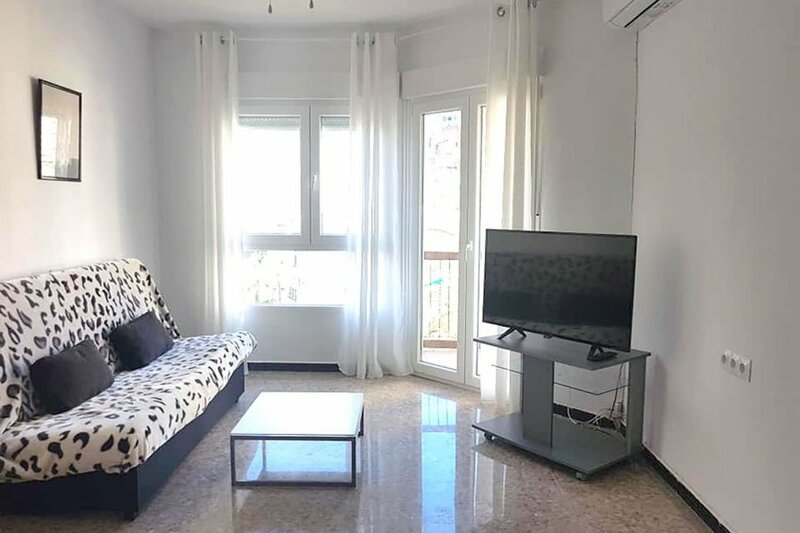 We have this great three bedroomed recently reformed apartment located in Edificio Algar in the heart of the Rincon de Loix area of Benidorm. The 3rd floor property is fully equipped for holiday rentals including bed linen and towels that are provided. The apartment sleeps up-to five persons with one double Bedroom, one twin Bedroom and a single Bedroom, all with fitted wardrobes. The property has two Bathrooms, one fully fitted Bathroom with bath/shower and one shower room. There is a fully fitted Kitchen with oven, hob, fridge freezer, microwave and washing machine. The Kitchen leads onto a small open terrace. The apartment has Aircon situated in the lounge and two bedrooms. The property has a great sized Lounge Dining room with local television, that leads onto the large open balcony. Guests can access parking upon availability, and access the swimming pool located in the neighbouring block.